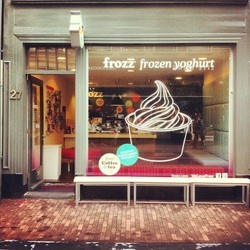 On a hot summery day I like to refresh myself with a good old Frozen Yoghurt! I'm not a big ice-cream lover..but I really go bananas for Frozen Yoghurt! I love it that it's so pure, low in calories and delicious in combination with just about anything.. fresh fruits, nuts, cocoscrisps, disco-dip.. and go on.. The staff is always kind and most important Hygienic!! They use gloves!! Love it!! I'm a bit of a hygiene-neat-freak..
- we stroll around the canals of Amsterdam and have nice conversations....while enjoying our frozz and a great view! Life can be goooddd..
Oh even when I'm writing about this makes me crave for a frozz.. I wish they'd do frozz delivery! Hope they read this.. haha.. hint ..hint..
let's keep it simple, the food is great, they mix the Asian and European cuisine together and they pull it of really well! I would recommend this restaurant for sure! The crowd is mostly a mix of tourists and business people...or in easy words..no hotties around here girls..but still...I love this place for dinner! 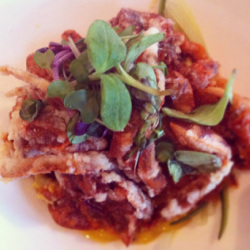 - Crispy Soft shell crab with mango and chilli lime sauce. - Scallops and edamame beans wit XO sauce. - Black Cod with spicy miso. 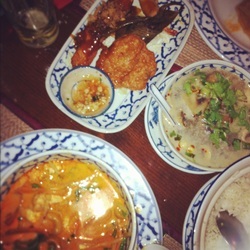 And last but not least, order the Coriander/Ginger rice instead of the normal steamed rice, it's really tasty! 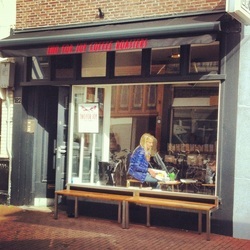 As I said before, for best coffees in town I like to go to 'Two for Joy' I think it's a pitty that they don't have any more shops around.. Yeah Starbucks is 'oke' but as a big Ice Coffee consumer there's really no place better where they serve them the best then here. The people who work here are always very friendly and they'll bring you your coffee, so not like all other coffeeshops that you order your drink and then still have to wait for it for them to make it, and just when your coffee is ready someone else already took that lovely seat behind the window with the nice view...familiar scenario right?! No.. at Two For Joy I just walk in.. order my delicious coffee and find a nice place to sit and they will bring my coffee..and they let me pay afterwords.. So for best coffee & service.. you now know where to go! One of the Thai restaurants I go to very often is 'Bird' they have a snackbar and a restaurant, their across each other at the main asian street; Zeedijk, the asian 'hood' of Amsterdam. - The Beef Laos Style ( the beef has been marinated in a sweet sort of soy ketjap, goes really well with the flavourful rice they serve with the dish. - The Spicy papaya Salad, this dish is for the more advanced spicy eaters! Very spicy, refreshing and delicious! I love love LOVE all the soups on the menu, I always order the one without coconutmilk with shrimps, I hear you thinking why I don't order the ones with coconutmilk, well because of my main dish is already prepared with coconut milk I like to have a bit of variety. 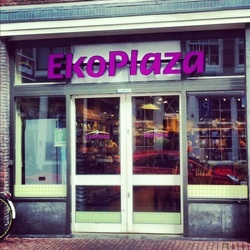 To have a nicely filled fridge I like to go to Eko Plaza and Marqt (I will post about this shop soon!). Eko Plaza has beautiful organic products and the best tea selection, can't live without my ginger/lemon or nettle tea. They have this wide variety of nuts, it's s sort of candy shop but then healthy! You get a bag and just fill it with different nuts and dried fruits. YUM! Another snack I love they sell here is the dried apple chips with cinnamon..